I’m reaching out to announce some upcoming changes you’ll be seeing here in the discussion forums. 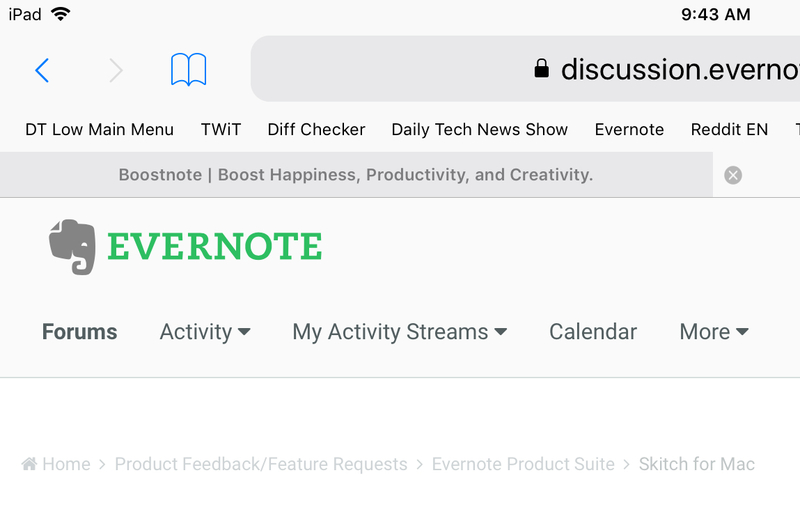 This will be a reorganization and overhaul of the available topics, threads, and layout of the Evernote Discussion Forums, aimed at improving the overall experience. I want to give a special thanks to many of our community members as their feedback and suggestions have helped us to shape many of the changes we’ll be making. These changes are designed to better align the discussion forum topics with the current state of Evernote’s products and brand, better enable our staff to more easily engage with our users and provide updates, eliminate redundancies, and better enable us to track trending issues/possible bugs. You may see some of the content from the forums temporarily disappear, or move from one location to a different location, as we work to migrate content to the appropriate areas within the new layout. In the meantime, feel free to start a new thread regarding any issues/topics if the older thread is missing, or you simply don’t find what you’re looking for. I’ll merge in any applicable threads to those new threads once everything is situated. Once we complete the reorganization and launch the new layout, I’ll provide an FAQ to provide some context for the changes, and where to find the content you’re looking for. Thank you for bearing with us, and thank you for using the Evernote Discussion Forums! If so, when is this likely to be fixed? Might help if you posted a link that fails for you, plus the search string and context . I don't see this failing. @mintymeerkat I reach out to our service provider. Unfortunately, we're experiencing some service errors, but thank for letting me know! We're currently investigating and hope to have everything ironed out fairly soon. I'll post and update once we have more information! Looks like this is an off-topic forum post that got moved/hidden. Gonna have to defer to @Shane D. on this one. Does this include the feature requests (Mac OS and iOS) forums? I have this running list of feature requests I have been meaning to upload, and I cant find the forum. Thanks! Managed to notice that, but you replied before I could get back to my question and negate it. Where do I go for my Skitch for Mac feedback? Navigating to https://discussion.evernote.com/forum/262-skitch-for-mac/ gets me an error. I just wasted at least an hour trying to get into this forum. I'm signed in as someone else, with a new profile, because whoever Evernote sub'd this out to has no way of letting existing members into the forum. At least not from what I'm seeing on my Windows Chrome situation. Has anyone else had this problem? This is not an improvement, what you have done to the forums. I don't like that they sneak around in my computer rather than let me sign in. Even signing out of all Evernote accounts, restarting my computer it still picked up the client account I had been signed into and forced me to create a new Evernote forum account. Once I did, there was no way at all to change the email address, so if anyone comments on my post, MY CLIENT will be getting the notifications. Thanks Evernote, for helping me come across as professional, not. I had to sign out of all four of the EBA's I was working on, go to the Evernote WEB access, sign in as my business on EBA WEB, then in a different tab go to Evernote Forums and surprise surprise, it knew who I was. So here I am, and my previous post hasn't even shown up yet. I have to scroll to the bottom of the forum to find what's NEW. I'm going to go check my blood sugars, because Evernote has really really frustrated me today. What a waste of three hours - and all I was triying to do was get help with a problem the SPACED Evernote Business has caused me. I'm not sure what you are smoking down there, but Evernote is really getting worse, not better with all these side - apps and enhancements that don't make any sense. Even signing out of all Evernote accounts, restarting my computer it still picked up the client account I had been signed into and forced me to create a new Evernote forum account. The forum accounts are wholly independent of your Evernote accounts, so far as I know, or at least how it's been as far as I've been coming here, and that's how it is for me currently. Perhaps it's different for Evernote business users, but I can't see why that would be. The second link to a specific discussion fails. We no longer have access to that specific forum. @DTLow Curious what link you are meaning by your statement of, “The second link to a specific discussion fails...” ? From just how your post looks/reads, I assume you are referring to @Guest Cooper’s post’s second sentence that begins, “I get this error...” Is that correct? If so, for me it opens a screenshot of the error message they receive when accessing the first link of their post. I don’t know why it seems users are seeing such different results... You say you can access the first link that @Guest Cooper posted, but I get the exact same error that @Guest Cooper receives. I started having this problem it seems like weeks ago now and I haven’t had any additional time to pursue it until today. Like everyone who has posted in this thread that they are receiving errors when trying to access different links, I also receive the errors they do. For example, when accessing the first link in @Guest Cooper’s post, the following is a screenshot of what I see. As a side note, the other problem I experienced back when I started receiving the above error was the link to choose a file was gone. The only options I had were the options that now appear under the [INSERT OTHER MEDIA] button. To clarify, the following is a screenshot excerpt of what was NOT appearing in my post back then. I thought I was losing my mind! I wasted a lot of time trying to figure out how I had posted screenshots before. I hadn’t done it for quite a while, so I assumed I just wasn’t remembering something, so I can empathize with all the frustration I’ve read in this thread. After learning about the changes happening to the Forum, I can only assume the effects of the changes being made are more than was ever anticipated. I’ll now have to try and see if I can access the main Forum links that have been stated as being in the upper corners. Hi, Is it possible to add the 'search for folder' back to the Evernote Clipper, instead of having to manually scroll down to find it? I'm using Evernote on Mac, and I have about 30 folders I use to save information on. Previously I would search the folder I wanted to save the article/content around (e.g. future of retail) but now I have to manually scroll down to find it which is time consuming. You tacked your request onto a completely unrelated discussion about forum organization. You'd should be posting in the web clipper forum. If your request is about the Chrome browser, there are known issues that Evernote is working on.